You can reduce your risk of bowel cancer by taking some simple steps to improve your diet. There is strong evidence that eating processed meat and a lot of red meat increases your risk of bowel cancer. To reduce your risk, limit how much red meat you eat and avoid processed meats as much as possible. Red meat includes beef, lamb, pork and goat. If you choose to eat red meat, you do not need to stop but limit the amount you eat to 500g or less (cooked weight) per week. 500g of cooked red meat is about the same as 700g of raw red meat. Eating more than this may increase your risk of bowel cancer. Red meat is a good source of protein but you can also get protein from many other foods such as fish, poultry, beans, lentils, tofu and eggs. You could try using chickpeas or beans to replace some or all of the meat in bolognese or chilli recipes. Processed meat is preserved by smoking, curing, salting or by adding preservatives. Avoid processed meats such as bacon, ham, sausages and salami as much as possible. Choose them as an occasional treat rather than every day. Hamburgers and minced meats only count as processed meat if they have been preserved with salt and chemical additives. Insoluble fibre bulks up poo and helps it move through the gut more quickly. This may help prevent constipation. Good sources of insoluble fibre include wholegrains such as brown rice, wheat and spelt as well as nuts, seeds, potatoes in skins and dried figs. Soluble fibre dissolves in water and forms a gel in the gut. This helps to keep poo soft, making it easier to pass. It can also help lower your cholesterol. 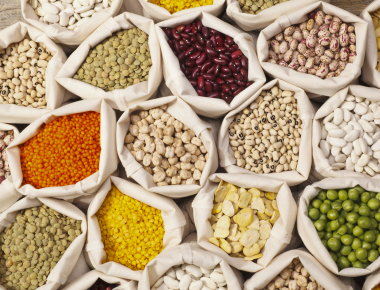 Good sources of soluble fibre include oats, barley, beans, peas, lentils, chickpeas, apples and carrots. You should try to eat at least 30g of fibre every day. Eating foods high in fibre will help you feel fuller for longer. This may help if you are trying to lose weight. As well as containing fibre, vegetables and fruit may also help to protect against bowel cancer because they contain antioxidants, which are substances that help to delay or prevent cell damage. Try to eat at least five portions of vegetables and fruit every day. This useful guide shows how you can get your five-a-day. If you want to increase the amount of fibre in your diet, you should do so slowly, especially nuts and beans. If you find that too much fibre causes pain, wind or bloating, reduce it by a small amount until your body adjusts and gradually increase it over time. People with existing bowel conditions or a history of bowel cancer may not be able to tolerate some high fibre foods. If you have had treatment for bowel cancer, you may find our booklet Your Diet: Living with and beyond bowel cancer useful. We need to drink about 1.6 to 2 litres (6-8 glasses) of fluid every day to stop us getting dehydrated. Water and low fat milk are great choices. Avoid sugary drinks such as cola, lemonade, fruit squash with added sugar and fruit juices (one small glass of fruit juice per day is enough). Fibre and water are a great combination for good bowel health. Being overweight or obese and carrying a lot of weight around your waist can increase your risk of bowel cancer. It is estimated that 11 out of 100 bowel cancers (11%) in the UK are linked to being overweight or obese. Take action if you start to gain weight. As well as being physically active, here are a few tips to reduce your calorie intake if you need to lose weight. Be aware of portion sizes, don’t overload your plate and avoid second helpings. If you are still hungry, have some fruit after your meal. Be wary of ‘large’ or ‘value-sized’ offers. They often give you more food than you need, leading to weight gain. Avoid sugary drinks such as cola, lemonade, fruit squash with added sugar and fruit juices (one small glass of fruit juice per day is enough). Alcohol is high in calories so limit the amount you drink. Watch out for extra calories from biscuits, cakes, sweets and crisps. Snack on fruit and vegetables instead. Set some goals for making changes and enjoy success. The energy in the food we eat is measured in kilocalories, often shortened to calories. The recommended daily calorie intake is around 2,000 calories each day for women and 2,500 for men. If you are very overweight and have other health problems, speak to your GP before beginning a weight management and exercise programme. Find more about how to keep your bowel healthy in our booklet 'Simple steps for Good Bowel Health'.